Prisons are awash with mobile phones, allowing inmates to continue a life of crime unhindered by locked doors and barbed wire. Why is technology not being used to stop them? Thousands of mobile phones are confiscated in UK prisons every year and many more – smuggled in or thrown over the wall – go undetected. They are a valuable illegal resource – costing between 400 and 1,000 just to borrow. The government’s National Offender Management Service (NOMS) seized 7,451 mobile phones and Sim cards in prisons in England and Wales in 2013. Using them, inmates had “commissioned murder, planned escapes, imported automatic firearms and arranged drug imports”, NOMS said. Machine-guns were smuggled into the UK by a prisoner organising the crime by phone from his cell. 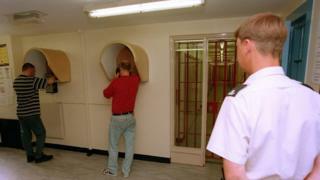 Judge David Farrell QC called the “wholly inadequate” prison security that had allowed the crime a “scandal”. Inmates have run a cocaine ring, arranged the murder of a teenager as part of a feud and organised the killing of a gang leader – all from their prison cells. The mother of an inmate in HMP Northumberland claims “the place is full of mobile phones”. “You’ve got people throwing mobile phones over the fences and then there are prisoners who have access to the grounds so they’re bringing them in,” she says. Glyn Travis from the Prison Officers’ Association (POA) says the jail is far from unique. “Drugs and mobile phones are freely thrown into prisons” with delivery by drone “completely undermining the external security that protects the public”, he says. 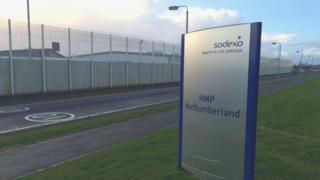 Sodexo, which runs HMP Northumberland, said “staff worked hard to stop illicit items getting into the prison using a range of technical and intelligence measures”. But the fact that so many phones make their way into prisons despite security precautions goes some way to explaining how hard it is to find and remove them. The obvious solution, says the POA, is to make them unusable. 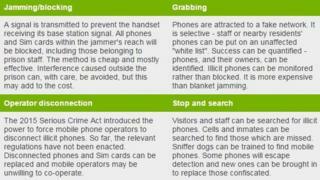 Mobile phone jammers or grabbers – which block signals or divert them away from their intended destination – are readily available. But NOMS says the expense is “disproportionate”, at up to 300m to fit and 800,000 a year to maintain. 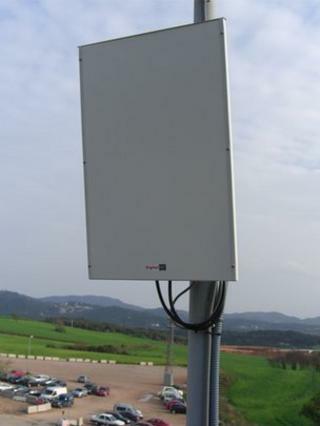 However, technology installers, such as US company Cell Antenna’s Howard Melamed, have been downplaying the cost of the technology for years. 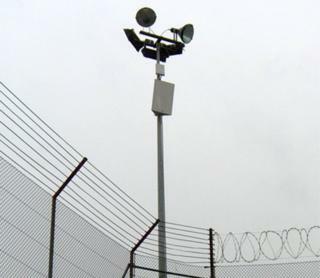 Steve Rogers, the managing director of electronic counter measures company Digital RF, says the UK’s wide variety of prisons – large, small, new-build, Victorian, open, high security – makes pricing “very difficult”. “How do you value this, that’s the question, isn’t it?” Mr Rogers says. The 2010 Crime and Security Act made possessing a mobile phone in jail punishable by up to two years’ imprisonment and/or an unlimited fine. But inmates do not worry about punishment for crimes committed inside, Mr Travis says. Prisoners in HMP Northumberland know they are not allowed mobiles, but “lots of them” have them nonetheless, the inmate’s mother says. Last year the government awarded a 60,000 contract to explore the use of mobile phones in prisons – how to stop them getting in, find those that do and disrupt those which cannot be located. The previous year the Scottish Prison Service announced plans to pilot blocking technology at HMPs Shotts and Glenochil. But NOMS specifically excluded such “prohibitively expensive solutions”, despite a change in the law in 2012 permitting their use in prisons. Then, in 2015, the Serious Crime Act introduced the possibility of regulations giving the government – and ministers in Scotland – the power to force mobile phone operators to disconnect illicit phones and Sim cards. Notably, the authorities would not need to find the phone to have it cut off. The regulations are still to be enacted. 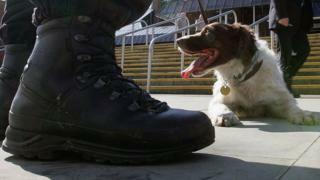 A Prison Service spokesman said they would be “introduced in due course”. But disconnected Sim cards and phones are soon replaced, Mr Rogers says. And cutting people off is not in the commercial interests of organisations that make money “making sure people stay on air”. “They only have to get one or two people wrong and they could be in a quite interesting legal situation,” he says. The POA has been lobbying for signal blockers for years, raising it with MPs and each successive government. “Every year they say ‘we can’t afford it, we’ll do a pilot scheme, we’ll do this’ and, whenever they try to do it, they say it causes too many problems – absolute rubbish,” Mr Travis says. Mr Rogers favours grabbing technology because prisons can see how many handsets have been disabled and to whom they belong. Blocking can sometimes leave small spots where a signal might break through and its effect is hard to quantify, he says. The prisons he works with can only measure success by the number of phones thrown in bins by inmates not wanting to risk punishment for an illicit item that no longer works. The Prison Service accepts jails are “in need of urgent reform” and it has to “look at new ways of finding and blocking mobile phones as well as as equipping prison officers with the right tools to tackle them”. It lists detection equipment, routine searches, CCTV, sniffer dogs and penalties – but is very reticent about its position on blocking technology. A spokesman refused to say whether the 2012 legislation permitting the use of “signal-denying” technology had ever been used. He also refused to comment on which publicised pilot schemes had taken place or what conclusions on cost and effectiveness they had come to. The POA believes blocking or grabbing would not only control prisoners, it would “have significant impact on the general public”. When the “people who’ve committed some of the most heinous crimes” can organise more crime from inside a prison, “how safe are your children?”, Mr Travis asks.